Cylindropuntia is a genus of cacti naturally found mostly in Mexico, though they also exist in parts of the U.S. Commonly called chollas, these plants grow free-standing in desert conditions and their spiky limbs often achieve a warped, twisted beauty. Chollas are among the most unpleasant of all cacti to accidentally brush up against since they’re covered in spines that bear tiny barbs which make them extremely difficult to remove from anything in which they become lodged. Merely brushing up against the cholla plant is enough to lodge their spines, so gardeners who grow cholla gardens should always take care not to touch them. However, Cylindropuntia plants can work well when grown together, especially because of the weird aesthetic charm that these plants can have; for instance, C. bigelovii, or the teddy bear cholla, has such soft-looking yellow spines that it resembles a stuffed animal! (Not that you’d be advised to hug them.) This is just one of about thirty species of chollas, and like many other species in its genus, the teddy bear cholla tends to drop its stems frequently to encourage further propagation. 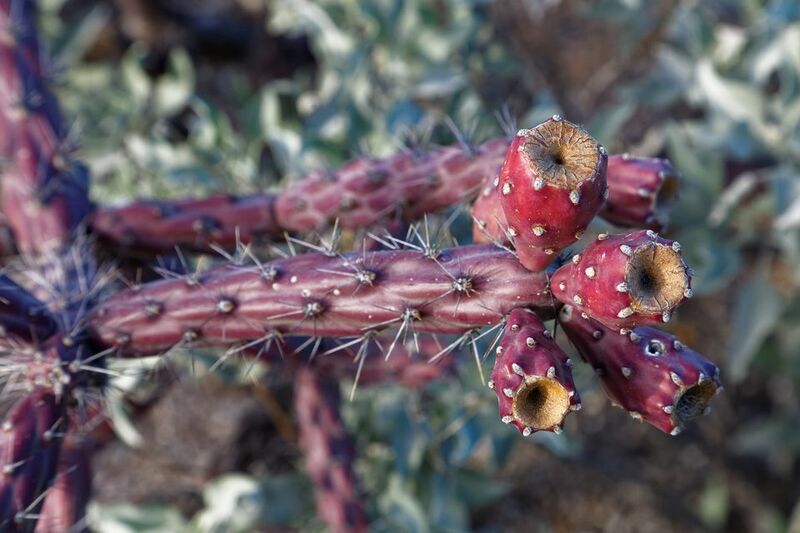 Cacti themselves are a somewhat acquired taste, and even with the family chollas can be hard to love because their spines have a special propensity to stick in anything that comes close. Nonetheless, lots of these plants are cultivated by cactus gardeners for their odd beauty, and like an ornery dog, you might eventually find something to love about chollas. Note, however, that there exists some taxonomic confusion regarding this genus; initially, these plants were considered part of Opuntia, but they’ve since been separated since their stems take on a different shape. Make sure, if you’re interested in these plants, that you know what you’re getting. Light: As cacti, these plants require lots and lots of direct sunlight. Make sure they’re exposed to the sun for hours every day. Water: Very little ​water is necessary for chollas; they’re used to desert climates where it rains infrequently. It’s much easier to kill them through root rot than through underwatering. Temperature: Warm desert-like temperatures. These are hardy plants, not easily killed by small changes in climate. Soil: The most important thing is that their soil is dry and drains well; prolonged exposure to moisture will rot these plants. Fertilizer: Feed regularly with a typical cactus fertilizer for best results. These cacti can be propagated by division of its stems, which is accomplished naturally by dropping them from the limbs of the plant. If you choose to manually propagate them, sever the stems and replant them in sandy, dry soil, making sure not to damage them too much in the process. Be sure and wear gloves, too, to avoid hurting yourself on the cholla’s prickly spines. For the larger varieties, this shouldn’t be necessary at all, since they’ll grow terrestrially and not in containers. If you do grow Cylindropuntia plants in containers, it doesn’t hurt to repot them periodically; lift the plant as a whole, knock away old soil, and replace it in another container, which then should be backfilled with potting soil. Again, any time you handle this plant, be sure to wear gloves, or else you risk giving yourself quite a bad day. One interesting Cylindropuntia is the diamond cholla, C. ramosissima, an erect cactus whose branches are extremely narrow and so close together that the plant takes on a bunched-together look. Another is the rat-tail cholla, C. whipplei, which has pleasant yellow blooms. Take note, however, that of the thirty-odd species in the genus, many are almost unheard of in domestic cultivation and are found only in the deserts of Mexico and the American Southwest. The best thing you can do for a hardy cactus like this is to leave it alone. Overwatering them is an easy way to rot the plant from the inside—remember, chollas are adapted to grow in some of the planet’s harshest conditions​—and they shouldn’t require any babying from you. These plants work great in a cactus garden, especially when they’re combined with other chollas, so gardeners accustomed to succulents may find them an attractive option.